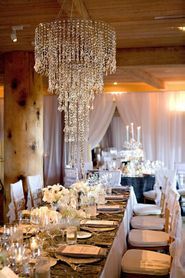 Our silver chandelier "Luna" is just waiting for a party! 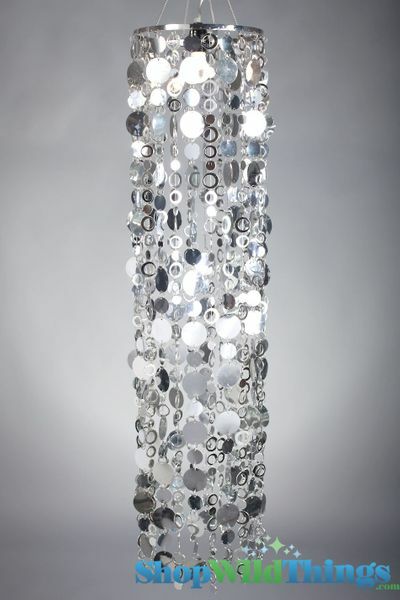 This beautiful mirror-like chandelier is ultra-lightweight and measures 4 1/2' long by 10 1/2" in diameter. 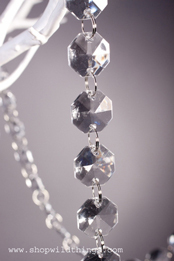 The strands are 44" long and this chandelier comes with a 10" long removable chain. Luna also comes with a plug-in light socket kit that uses a standard light bulb, up to 60 watts, so you have an instant party chandelier or you can remove the hanging chain and light kit and place it on a centerpiece or floor riser! The PVC hoops and discs are very lightweight and the strand lengths can be altered. The hoops are connected by silver strands that you could cut to shorten them and the discs are connected by tiny silver jump rings. There are 24 strands of hoops and discs and in between each is another hole on the top ring so you can add more goodies like sparkling crystal strands! Our crystal strands also have jump rings, making them very easy to attach to the top ring of Luna (just in case you needs more sparkle)! Instead of the light kit, another option is to downlight by using an LED light saucer. 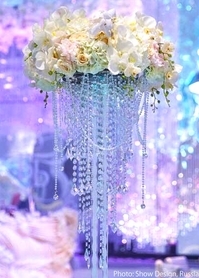 Hanging or sitting atop a floor riser or centerpiece riser, with or without lighting and an option to add more bling, Luna really is a flexible party piece that just wants to make your party rock!